Hailing from an independent bottler from an undisclosed distillery, without an age statement and bottled at cask strength. What? Are you guys serious? You'd probably say hell no to drinking something like that, but then you'd open the bottle and just after the first smell your lungs would be revived, you'd go for that first sip that punches you in the face..in the best possible way. 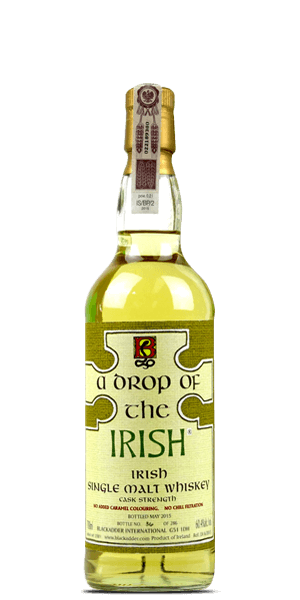 Bottled at 60.4% ABV this is quite an unusual Irishman that really delivers something else. Some say that it might be Bushmills, but what we know is that it surely doesn't have any gloves on. A must try. What does Blackadder 2015 A drop of the Irish Cask Strength taste like? The Flavor Spiral™ shows the most common flavors that you'll taste in Blackadder 2015 A drop of the Irish Cask Strength and gives you a chance to have a taste of it before actually tasting it.